#15 Boston College scored twice in a 44-second span in the first period and its goalie Joe Woll stopped 36 of 37 shots as the Eagles went on to a 4-1 win over the Terriers at Agganis Arena. 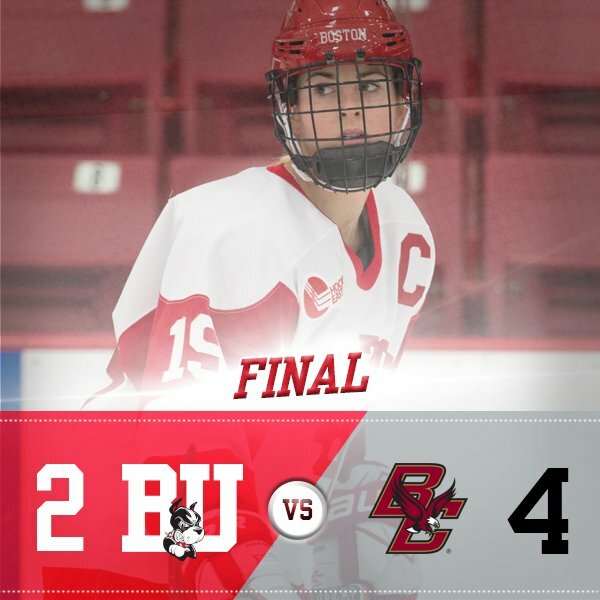 The loss, following Friday night’s 7-4 win at BC, continues the unsatisfying pattern of one win, one loss weekends that have characterized the first half of BU’s season. BU was unable to convert on any of its six power play chances, but managed to kill five BC power plays. The Eagles opened the scoring at 13:33 of the first period on an odd-man rush when Connor Moore flipped a backdoor pass into a half-open net. Less than a minute later, skating four-on-four, David Cotton stripped the puck from Chad Krys and skated in alone on Jake Oettinger, who made the initial save, but Cotton slid the rebound home for a 2-0 lead. After having been outshot in the first period, BU carried the action in the second with a 17-9 shot advantage and finally got on the board when Shane Bowers deflected Kasper Kotkansalo’s point shot over Woll’s glove hand. Logan Cockerill also assisted. However, BC regained the two-goal margin when Ron Greco scored his third goal of the weekend late in the period, taking a drop pass and firing it from the left circle. BU again had the territorial and shot advantage in the final period but couldn’t solve Woll, who turned aside all 13 Terrier shots, including a point-blank shot by Jordan Greenway after Bobo Carpenter’s entry pass. Graham McPhee’s empty netter closed out the scoring. “Unfortunately two costly mistakes early put us down 2-0 again. It’s tough to dig yourself out of that hole when you have a first-place team in here with a goalie like that. Danny O’Regan assisted on both San Jose goals in the Sharks’ 5-2 loss to Tampa Bay. Charlie Coyle assisted on Minnesota’s overtime game-winner in a 2-1 win against St. Louis. 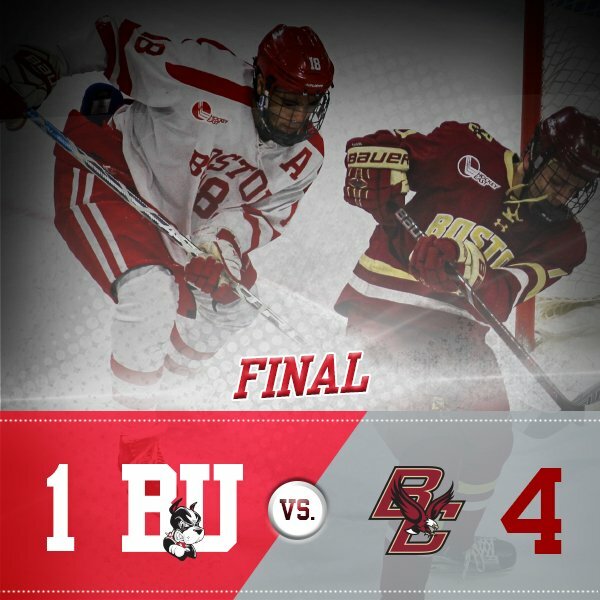 A pair of third-period goals by BC broke a 2-2 tie and sent the Eagles to a 4-2 win over BU. Both Terrier goals were scored by Captain Rebecca Leslie. She gave BU the lead after one period with assists from Mary Grace Kelley and Victoria Bach. BC countered with two goals in the middle period from Darryl Watts. Leslie’s second goal late in the period, assisted by Abby Cook and Nara Elia, knotted the score. Senior goalie Erin O’Neil stopped 35 Eagle shots.